#547 Super 40's Dallas TX Restaurant View! #490 Large Letter Waco Texas !!! #450 Large Letter Abilene Texas ! This vintage 40's Tex. postcard is a nice one! Known as a "large letter" postcard, it has a different local view inside each of the letters spelling out the town name. A nice old postcard view! Back is divided and is postally unused. Condition is near mint as shown. Any other lines or waves are from the scanner and not on the actual image. Your item is shipped to you safely in a rigid mailer. Here is a super early 40's linen postcard view of a beautiful cathedral and park plaza at San Antonio Texas! This nice old 40's or so postcard pictures the old Frost building at right and a shopping district. To the left is the San Fernando Cathedral and Main Plaza Park. Vintage 40;s cars are parked on the street. A neat old Tex. image! Back of card has landmark details and is postally unused. Condition is excellent. Any lines or waves are from the scanner and not on the actual image. Your item is shipped to you safely in a rigid mailer. This old image is a neat one! It pictures an early 1940's postcard view of the Del Camino Courts at El Paso Tex. !!! This looks like it was some place! Easily seen in the old building with archways. The roof appears to be clay tiles. Vintage 40's autos are parked nearby. 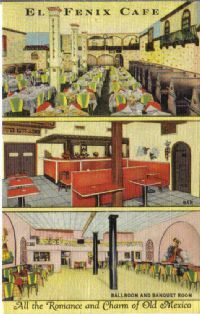 The front of the card reads "Del Camino Courts , El Paso , Texas , 4900 Block , Alameda Ave., U.S. 80 East, Steam Heat, Air Conditioned". Back of card is divided and is postmarked "El Paso Texas Nov 15 1946". Condition is excellent as shown with light corner wear and NO CREASES! This is nice. 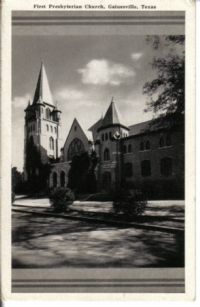 It's a 40's era postcard view of the old Gainesville First Presbyterian Church. The postcard almost looks like a Real Photo, but It's actually a "Natural Finish" image. The card reads "First Presbyterian Church , Gainesville , Texas". Condition is very good with slightest of corner wear. #220 Motel Villa El Paso Texas ! This is nice. It's a 1940's to 50's postcard view of the old Motel Villa at El Paso Texas. At left is the motel office building with vending machine and chair outside. To the right is the motel building with sign at front. The card front reads "Motel Villa , El Paso , Texas , 6025 Montana St. East, Hiways 180 & 62, On the Carlsbad Cavern Hiway, Ph. PR 2-0752". Back has complete motel details printed. A neat old TX view! Condition is near mint to mint! Any lines or waves are from the scanner and are not on the actual image.